The earthquake affected 375,000 square miles, through San Francisco. Eathquakes also happen around plate boundaries. It was caused by the tectonic plates moving and San Andreas faults moving too. It damaged the whole city and it also went to few other places. Earthquakes usually happen when the tectonic plates and faults move around. It shifted the ground for about 4-5 feet per second and it traveled at 5,900 miles per hour. The earthquake destroyed buildings, killed people and animals, etc. It also caused a fire which even made the disaster worse. Through this strong earthquake, San Francisco and other places that earthquakes like this have hit. their best to come up with ideas that will prevent this type of disaster. 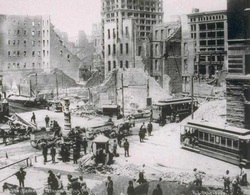 1906 San Francisco earthquake was a strong earthquake and is an event in history.